By the end of this week, Ukraine may transfer $2 billion to Russia, said Günther Oettinger, EU Energy Commissioner, after talks in Berlin. The situation is complicated by the fact that Russia sees this money as part of a debt payment, while Ukraine sees it as an advance for future gas supplies. The impasse between Ukraine and Russia over outstanding payment owed by Kiev to Gazprom for shipments of gas appears to be a step closer to being resolved, following trilateral talks in Berlin between Russia, Ukraine and the EU on Monday, May 26. According to European Commissioner for Energy Günther Oettinger, Naftogaz of Ukraine is ready, by this Thursday, to transfer $2 billion to the account of Gazprom. “This will act as a clear signal about Ukraine’s liquidity,” he said after five-hour talks in Berlin. According to him, the parties had agreed that by transferring $2 billion by May 29, the negotiations could continue and the two sides could start discussing the future prices of energy resources. “The goal is to agree on a mutually acceptable price for gas by the end of the week,” said the commissioner. According to a source of the Russian daily newspaper Izvestia, who was present at the negotiations on the Russian side, the Ukrainian party promised to transfer $2 billion to Russia by the end of this week, and another $500 million by June 7. After this, the parties would be able to sit down once again at the negotiating table. According to Pavel Zavalny, president of the Russian Gas Society, if Ukraine fulfills its promise and makes a payment in the next few days, then it would make no sense for Russia to insist on a price of $485 per 1,000 cubic meters. In return, according to Izvestia’s source, close to Gazprom, the price for Ukraine could be set in the amount of $380-390 per 1,000 cubic meters, but only if timely payments continue to come from Ukraine. “The Ukrainian side has agreed to take this matter for consideration, so to speak, to the Ukrainian leadership in order for them to approve the payment this week of $2 billion for gas supplies. Well, this is something at the very least,” said Alexei Miller, head of Gazprom, in an interview with TV channel Rossiya 24. Since Gazprom announced that it was switching to a prepayment scheme from June 1, Ukraine has neither paid any of its old debts nor made any new deposits for future gas deliveries. This means that starting on June 3, the country will no longer be receiving gas from Russia for its needs, and gas will be delivered only to Europe. Moreover, the Ukrainian side is not prepared to pay a $2.2 billion debt that was formed back in the first quarter of 2014, when the price of gas was $268.50 per 1,000 cubic meters. Ukraine currently owes in excess of $3.5 billion for already supplied gas. After the incorporation of Crimea into the Russian Federation, Gazprom canceled the price discounts it had previously provided on gas for Ukraine, and starting on April 1, the price was increased to $485 per 1,000 cubic meters. “The Russian side continues to hold to its unconstructive position and keeps demanding unconditional payment of all invoices, including ones with disputed amounts. Naftogaz of Ukraine has once again confirmed its willingness to clear its unpaid bills, subject to a civilized compromise being reached, one that will ensure continuity of gas supplies to Ukraine,” says an official statement released by Naftogaz. However, Ukrainian Prime Minister Arseniy Yatsenyuk, speaking at a meeting of the Ukrainian government, unexpectedly linked payment of the gas debt to the status of Crimea. According to him, Ukraine wants Russia to pay $1 billion for 2 billion cubic meters of gas owned by the Crimean company Chernomorneftegaz and being held in underground gas storage facilities. However, according to this company, the capacity of storage facilities in Crimea is designed for only 1.2 billion cubic meters of gas, and only 768 million cubic meters have been pumped into the reservoirs. 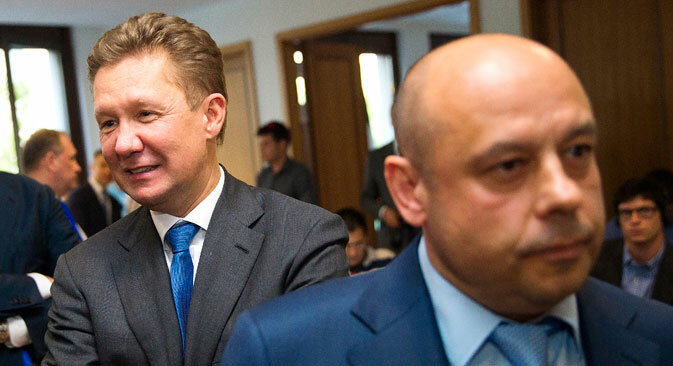 Moreover, Gazprom claims that the payment of the gas debt can in no way be connected with the status of the peninsula. Based on material published at RBC daily, RIA Novosti, Izvestia.